Looking for Experts in Visual Enhancements? In terms of local promotion, banners are a powerful way to get your customers’ attention. The good news is that banners are affordable, simple, and memorable. Whether at an outdoor event, show, or displayed at a traffic intersection, banners will command attention and reach hundreds or thousands of potential customers in a community. 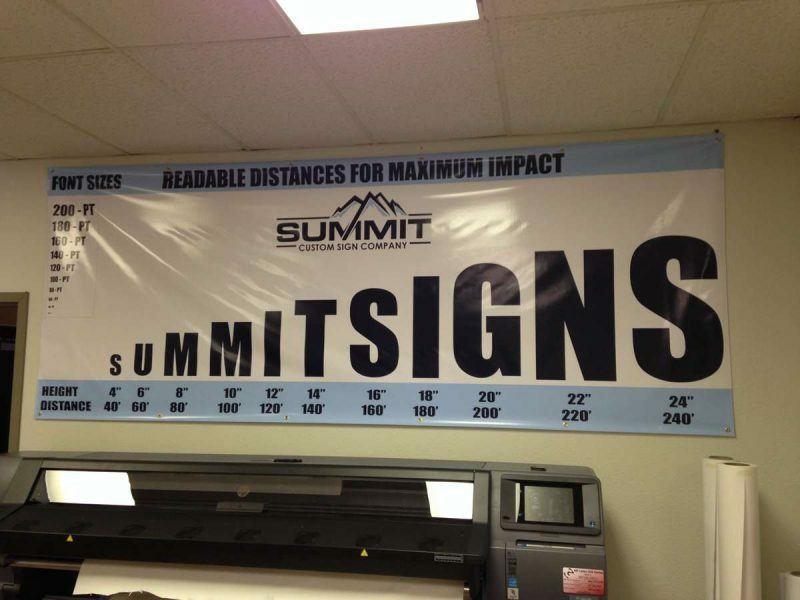 Summit Custom Sign Company offers you quality products, maintenance services, and affordable prices. Tell us about your project; no matter if it is big or small, we’ll work it out for you. Just ask for a free estimate. Our staff will work with you, using limitless options to create banners that will guarantee the promotion of your product. We use the best materials – UV-resistant inks, quality vinyl, and metal grommets – to increase the longevity of the banner. We will assist you in choosing the correct style, size, message, materials, and location. Our goal is to satisfy the client by creating a big impact on the customers. To maximize the effectiveness, a banner must be simple. This means it has to be short, using a limited amount of text so drivers can understand the message at a quick glance. Always create a URL that customers will easily remember. To command customers’ attention, banners should have contrasting colors, unique images, and big, bold headlines. If you want your brand to appear trustworthy, it is necessary to use high-quality vinyl, UV-resistant ink, and metal grommets or hanging accessories that assure an amazing image of the banner. Banners will be memorable and effective if they are simple, well-designed, and quality printed, along with having good materials and a good location. They will get noticed and will easily call people to action. If you need advice and a free estimate for your banner needs in Colorado Springs, contact us at 719-694-9146.